During 1997 the National Rugby League decreed that from the year 2000 there would be only 14 teams in the elite competition, with no fewer than 6, and no more than 8 being from Sydney. Which teams would be included, and which excluded, would be determined by certain criteria. These criteria included such factors as success on the field, home crowds, away crowds, gate takings, and sponsorship. Whilst Canterbury were well ahead of other clubs in most criteria, the area where they fell down was in home crowds. 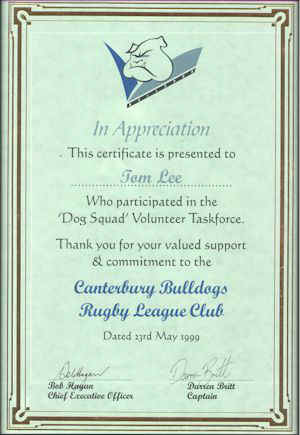 In January of 1999, Canterbury Bulldogs Season Ticket Holders were asked to join a volunteer task force with the goal of saving the Bulldogs, as we know them, from extinction. Around 30 dedicated supporters (including myself) answered the call. In February 1999, the Dog Squad, as we became known, telephoned over 8,000 households with the goal of signing them up as season ticket holders. Within six weeks we doubled the number of Canterbury season ticket holders from approximately 1,300 to over 2,600. Today, Canterbury's season ticket holders is second only to Parramatta's in the Sydney metropolitan area. In 2000 we aim to be number one. If you are a dedicated Canterbury Bulldogs Supporter, and wish to see Canterbury survive and flourish in the 21st century, you can help. Email me for more information.